WHY??? If MDS (our disposal company) sees any plastic bags, plastic wrappers, cardboard, or my favorite ~ book bags full of sneakers and beer bottle caps ~ they take all of that beautiful recycling and dump in into the landfill with everything else. Let’s look at the rest of the recycling on campus…..
Paper: The only place to recycle paper is in the academic buildings (where the plastic and glass receptacles are), or in the Paper Retriever dumpster behind the Library (coming next week) so you have to bring your paper with you to class!!! Electronics (computers/printers/etc. ): Bring them to Marcucella Rm. 210 (my office), or give me a call X4255 and I will come and get them! 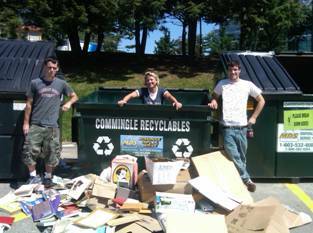 Cardboard: The only place to recycle cardboard (except for on Move- In Day) is down at the warehouse (if you are on your way to Earl the Sandwich Master’s place, it is the first left after you leave University Rd.) or you can find a bin behind the dining hall. Ok, so now what is up with the blue bins in each of your classrooms??? They are JUST FOR PAPER!!! (I had no idea, either.) We are in the process of putting signs above them, so spread the word! Your bottles and cans must go in the recycling receptacles in the hallway/foyers of the academic buildings. Oh, and if you throw the wrong things in the wrong places, either I, or some other unlucky soul, must go dumpster diving and sort it all out. My husband is thrilled. PLEASE HELP!!! *Glass never wears out — it can be recycled forever. We save over a ton of resources for every ton of glass recycled — 1,330 pounds of sand, 433 pounds of soda ash, 433 pounds of limestone, and 151 pounds of feldspar.